Blade - Dispersion 48 mm dia with 8 mm dia bore - with set screws 316 SS electropolished. These impellers are for use with Caframo's overhead stirrer models and of course, any overhead stirrer as well. Impellers are sold individually except when explicity noted otherwise. Please click 'More Info' above for line art, specifications and the Caframo stirrers that are suitable for each of them. 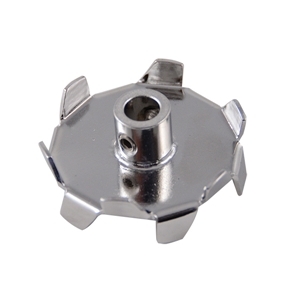 Choose the right part for your needs from the various stirrer accessory, stirrer paddle, stirrer propeller, stirrer impeller shown here. Click on the 'Downloads' tab above for information on choosing the right combination of stirrer, stand, base, shaft and impeller.